My front garden in springtime. Oh my god, its absolutely stunning. Absolutely stunning! bring on Spring! That is colour therapy par excellence! Stunning! just what I need to see at this time of year! I can never see enough of this and I STILL want to be your postman! I love those little tulips making such a statement. Just beautiful Tt....is this last year? You've all this to look forward to....it looks gorgeous! What lovely colours - very impressive!!! That is a really pretty garden TT! Beautiful TT, lovely colours - it won't be long now 'till you see this again. What are the tall flowers in the middle? Stunning! Something to look forward to. the tall flowers in the middle are tulips... can't recall the variety, but if I remember, I'll add it to these comments..
Wagger... my gorgeous young postman wears shorts, even in the winter..... is it any wonder I welcome him with all these flowers ? LOL. ... worth the effort to enjoy the flowers.. 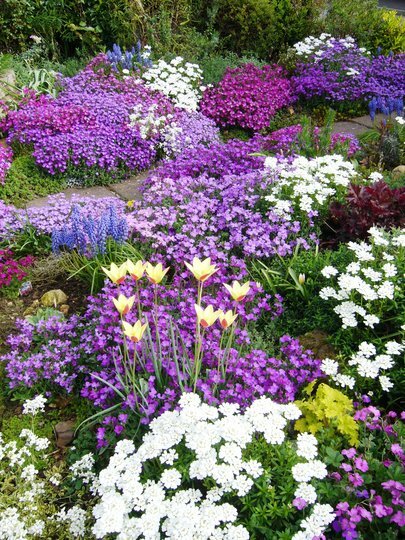 The composition is mostly various colours of aubrieta, and also Iberis sempervirens and grape hyacinths. What is it with postmen and shorts in winter - your postie is number three! Aren't we lucky? We have a young women with long blonde hair as our postie and she's really nice. Always cheerful and takes the time to speak to you too. Wow!!!!!! Please tell me how?!?! These are the colours I have just got plugs of bedding plants in but I bet mine does not look like that!! This is beautiful TT. I knew this pic must be yours when I saw all this gorgeous aubretia in the thumbnail! What a sight for sore eyes. Can't wait for the warmth to wake up this wonder again. :-) Wonderful. Is the sun getting higher in the Alaskan skies ? ....need warmer days, don't we ! Must admit I bought a couple more little aubrieta plants today. My friend with me said "You've already got aubrieta." I replied......."Now I have even more aubrieta" .....LOL. beautiful .. I wish spring would hurry up !! I guess you had cold, heavy cloud over Norfolk today ! Look out for a large package marked First Class LOL. Gorgeous! The flowers not the postman...You will have to post photos of him here for me to be able to comment on him. My mailman is nice man but I doubt that shorts would improve his appearance. :-) He has just retired and I will miss him. Well behind this year..still nothing showing in my garden...1 Crocus only. This must be the most beautiful front garden I have ever seen.......amazing a work of art TT. One of our postmen wears shorts all year round, as well. His knees must get blue on some days - at least he has a van! Thankfully our postie rarely wears shorst. he has the skinniest legs and nobbliest knees I hae ever seen :o) But he has a lovely face so it doesnt matter. Oh boy.... I wouldn't move anywhere and stay there entire day.... such beautiful!!! A stunning display TT, such an underestimated little plant is Aubrieta yet it flowers its little socks off for weeks on end. In the garden where I was a child, aubrieta always gave a pretty display every springtime , and I've loved it ever since. what can I say that the others havnt already said! ..............astounding! Yes, I agree (with DD2) that takes first prize. The differing shades of purple/blue remind me of my mother's cinerarias, but somehow I prefer these shades. Does one pronounce it Aubrey-Etta, I wonder. The way Ione writes it, aubretia, does seem to follow the usual flower ending more closely. That would then be pronounced Aubreesha, presumably. Beautiful ! So much color. Thanks, I am glad to learn on this site - the teachers are so kind - and I never studied French, either - only Latin and Spanish. Nevertheless, it does seem to me that Aubrietia might have been a better idea. More in line with Fuchsia, Escoltia (actually spelt eschscholtzia, CAN YOU BELIEVE IT ?) etc. I'm also going to google this Claude, right now. mmmm, I must make a list of all those plants in your front border, what's his name , wagger? Although I do need to find out our postman's favourite plant, he has quite nice legs too, and tattoo's! Your very naughty Sandra, I'm getting terra to send VIA Somerset before he comes up to yours! The last resort is posting mail to yourself... Lol. I'm pleased you like the photo. Oh my gosh! The spelling - aubrieta! I always thought I saw it aubretia. Hmmm...I learned something too! The plant is often mis-spelled as Aubretia... even in books etc. Very pretty flower, however we spell it... !!! Lol. I've never seen so many beautiful flowers in one yard - absolutely breathtaking! Bring on the Spring. Yes, Aubretia is a lovely sight and according to dr Hessyan of expert books fame is one of the heralds of spring, I noticed the blue starting to come into it on the walls as I drove to my allotment yesterday, stunning, I hope your display is just as nice as previous years Terra! P/S, has the postman been yet? lol. Hi Micky... Yes he has..LOL. and photograph the aubrieta on the walls please ? Hi Im a new member and I must say ur garden is breathtaking. The flowers look excellent. Congratulations!! I would love to have a garden like yours. Hello Geeta2311... Welcome to GoY. ! Thank you. I'm pleased you like my garden. I'm sure you have some lovely plants in pots. Good luck with your petunias, delphiniums and salvias. This is stunning TT - your obvious hard work has repaid you back with high interest! This is a different area of my front garden to last year's photo, including the tulips, but the aubrieta grows equally well here. Is the soil in your garden alkaline or acid ? How are the motorbikes ? but are they acid loving? I am pleased to tell you that you have taste and consideration of Art. Thank you. I'm glad you like this planting design. just breathtaking t.t wud love this in my garden. terratoonie,you are what gardenings about,wish i had colour like this,i have a small gravel garden and won an award with it,but can imagine yours must have won many!.ground force inspired eh? Ground Force inspired ? Lol. Did you see my blog of 29th April 10. ? ... Terra Dimmock ? Lol. Oh my look at those colours. This is just stunning. incredible! wish you lived near here ~ i would walk down your street everyday just to see that! you are a garden genius! many thanks ~ one day??? can you do mine too please TT? i would pay you in hobnobs?? ... Chocolate hobnobs ... ??? i shall be buying them in bulk tomorrow! Lovely to look at this again and a big thank you for sharing it with us. I look forward to seeing the 2011 version. Hope you had a great Christmas and Happy New Year everybody. Yes, I'm looking forward to springtime flowers. I have just spotted 2 heucheras in there, one lime green the other a dark colour. It is not just a spring flowering garden then. It is stunning. This is fab what plant is it it looks to me like a ground cover just what I need please let me know as this is fabulous. The purple flowers are aubrieta.